Updated the link in our API configuration to point to Powercode v19 Documentation. Updated references for old ACH processing index to point to the appropriate URL. Added ‘Name of Card’ to the Payments Received Report. Fixed several pagers that were not displaying the appropriate amount of items in the table. Limited transaction selection to prevent some transactions from displaying in the wrong section. Resolved an issue where the Customer Usage Report would not load as expected. Updated Network Location notes handling to avoid a case where you were unable to add a new Network Site. Fixed an issue where email event logs would be malformed. Removed a deprecated reference that was preventing customer statuses from being updating while having ezPhone enabled. Uploading customer files will now uniformly record the WebUser uploading, as well as more uniformly logging the changes being made. Manually entering an IP in the Equipment Form will now filter which Address Range it should be in and selects it automatically if there is only 1. Custom Charge dates will now properly save as a 24 hour format instead of the previous 12 hour format. Payment Gateways that do not support BankAccounts will no longer display this as an option. Payments will now properly re-activate accounts when submitting a payment through the admin portal. Setting a Grace Period to 0 will no longer cause the default Grace Period to be reset incorrectly. Resolved an issue that would cause pending or incomplete BankPayments to not be verified (or returned) properly. Returned check event logs will properly record the TransactionID instead of previously recording the record ID. Updated IPPay Payments to correctly label API payments when they are posted. Corrected spelling when successfully switching a PaymentAccount to Automatic. Added webhook trigger for deleted payment account to activate from the Admin Portal. BankAccount icon will no longer display alongside the CreditCard widget when making a payment. Fixed CreditCard expiration validation attempts failing on certain Payment Gateways. Updating partial Unimus configurations no longer updates the entire category. Resolved issues that were preventing the merge / mass status bar from displaying as expected. Scheduling a network job is now limited to creating one job and will no longer create multiple jobs if submitted multiple times in a row. Hosts that are unset in Saisei are now set into the default rate plan instead of the delinquent plan (by default). Fixed several cases where Saisei customers would not be updated in Saisei. Updated equipment parent selection to only update the parent if it is an exact match. Updating infrastructure equipment will now properly update infrastructure leases as well. Updated a database timeout restriction that was causing issues with large backups > 30G. Updated our daily OUI build to generate values using the new file structure as expected. Increased session expiration time to previous default of 8 hours (up from 1 hour). Updated all Payment and Refund logs to be consistent and display both the attempted amount and last 4 digits of the account. Add Payment Account will now allow you to switch back to the Credit Card tab. Add Payment Account will no longer always save new Payment Accounts as “Automatic”. Added Bank icon to the Add Payment Account Bank Account form and to the Make Payment wizard. Customer name will now automatically populate when adding a new Credit Card or Bank Account to their profile. When making a payment with a primary Bank Account we will no longer validate for non-existent expired dates. Custom amount box input in the Make Payment Wizard no longer displays unless the corresponding radio is selected. Errors now display properly on the Make Payment Wizard instead of just redirecting to the same page with no indication that an error actually occurred. Submitting a payment would sometimes pull the Amount Due when selecting Current Balance – we now pull the correct amount. Refunds will now display and log the actual refund amount instead of always showing the full amount. Resolved a memory issue that occurred while generating monthly invoices that would cause customers to not receive invoices. Minimum payment amounts were only loading for Credit Cards, we now load them and properly compare against both Credit Card and Bank Account payments. Add Payment Account address selection for Credit Cards will now include all states for a given country, instead of just including Service Areas that exist in the system. Zero dollar amounts will no longer sometimes show as negative in the transaction log. We now only check equipment if it is a supported Equipment Type (avoids checking equipment that doesn’t support this process). Updated the way we save SNMP information for Equipment to avoid issues where we couldn’t properly save the information at all. Equipment will now properly save Device Type default SNMP information when changing Device Types. Inventory deployed status can be changed again after its been assigned to a customer account. Updated address ranges with one IP to prevent MikroTik from erroneously removing them. Resolved issues with SCP backups to avoid attempting to backup from the wrong location. Updated comparison method to resolve some cases where recording data usage results with Preseem was inaccurate. Fixed a fringe case where Unimus wouldn’t properly retrieve backups. Customer Event Logs on the Customer Overview that are truncated will now display the entirety of the log on hover. Updated customer portal settings Payment Delete terminology to clarify what its function is (Payment Account Deletion Permissions). Call logs will now be loaded by creation date instead of re-ordered based on the last updated timestamp. Added last 4 digits to the PaymentAccount display when selecting which account to make a payment with. Customer portal overpay settings are no longer applied to a portal payment when the setting is not active. Saving non-numeric or decimal amounts for minimum credit card or bank account payment amounts will no longer incorrectly validate when trying to submit a custom payment amount. Customer tags can now be edited after creation. Fixed a system error that would occur when attempting to switch services. Financial Dashboard recurring revenue chart can now be filtered to display by Month (Bar Graph) or by Day (Line Graph). Fixed the twilio log so it no longer loads inaccurate “duplicate” entries. Updated SendMassSMS to account for invalid phone numbers. Failures will now be logged instead of causing the entire SMS process to fail. Increased session expiration time to be 1 hour (up from 25 minutes). Some installations were causing sessions to expire and work to be lost due to the lower timeout. Removed several references that were trying to update legacy file structures as part of a legacy process. 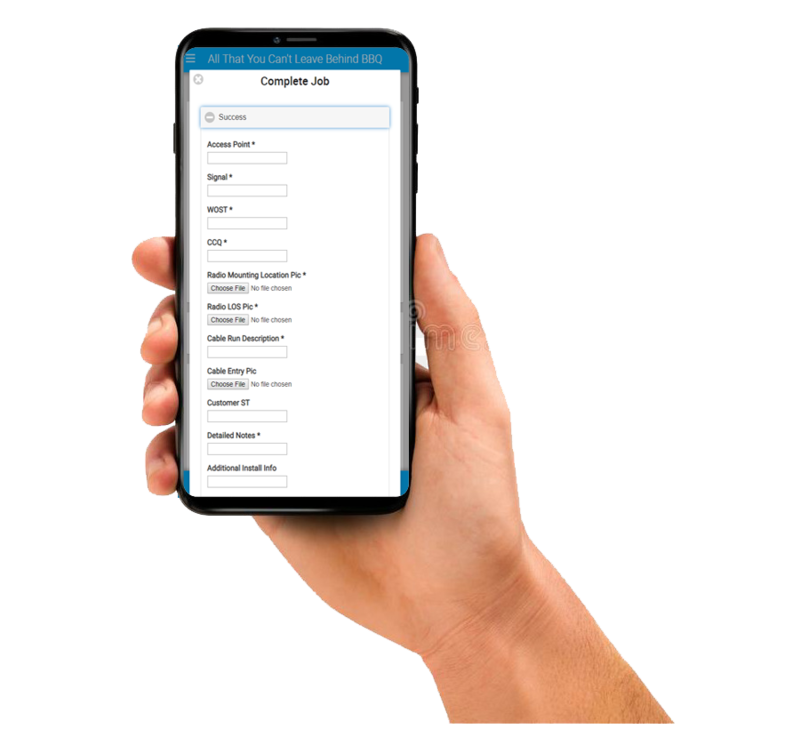 Job Completion Templates are an excellent way to manage installation/repair quality, keep your technicians accountable and gain valuable insights and trends. These Completion Templates are associated to one or multiple Job Templates, see the Job Templates tutorial here and are displayed when a technician completes a job after checking in on the mobile view of Powercode. 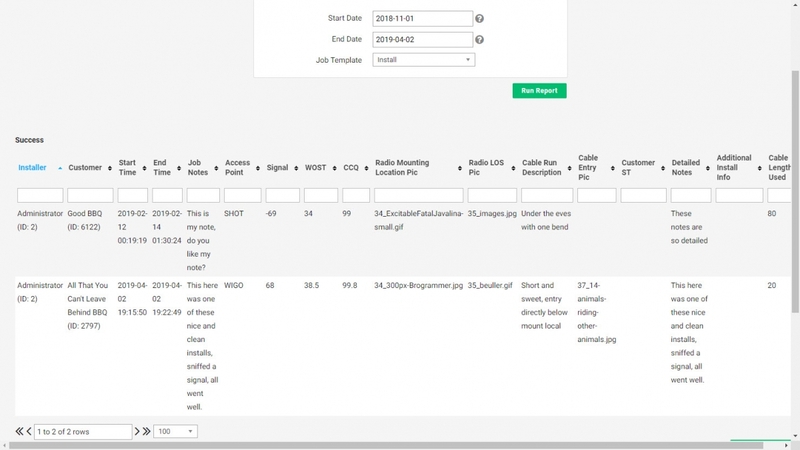 The results, which include the option to upload a picture, are stored on the customer account but can also be displayed per completion template type on a report. This report will allow you to see trends in install characteristics such as signal strength or wide open speed tests or whatever else you choose to capture. Each Job Template needs both a succeed and fail Completion Template. A single Completion Template can be used for multiple Job Templates, this will be common for fail Completion Templates but most likely there will be different things that should be captured on the success Completion Template side. To create a Completion Template, from the global nav bar hover over “Install” and select “Completion Template” then “Add Template”. Give the template a name and then click the green plus circle. For each row provide a name to show on the form and then choose from text, number, image, file or select. 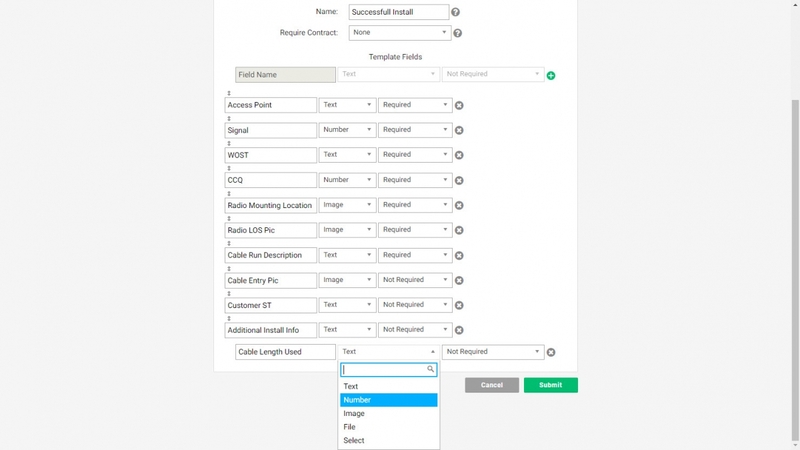 That last option provides the ability for a drop down with set multiple choice inputs. Then choose whether the field must have an answer for the form to be submitted. Repeat for each piece of information you wish to collect. The results of the Completion Template can be found on a customer account under the “Jobs” tab and then from the “Select an Action” drop-down “View Completion Data”. To see trends or multiple results in one place navigate to “Reports” from the global nav bar and under the “Scheduling & Service Reports” select “Completed Jobs”. Cost Input field can now be locked for Bulk Entry Mode. Resolved an issue that was preventing backups from accessing new job files and new job files from being created. Updated customer wizard settings to create defaults to resolve issues with defaults not already being set (settings not applying or saving). Fixed a bug that could prevent some custom info from displaying as expected. Updating a customer account with no customer group no longer breaks after saving. Updated legacy payments so their type is properly reflected in the queue. Resolved an edge case where generating receipt PDFs would fail. Fixed a bug that would cause IPPay failed transactions to not log results properly. Added additional form validation to fix issues with the payment form not submitting at all. Making a payment set as the current balance will now pull the appropriate amount, instead of processing the payment for the amount due. The payment form no longer includes archived customers in the search results. Payment exceeded warning should now display as expected in the admin portal. Resolved several issues that were preventing IPPay BankAccount refunds from processing as expected. Fixed an issue that would sometimes prevent invoice emails from not being generated. Fixed a bug preventing status check, community string, and snmp version from updating as expected. Resolved an issue that was preventing ICMP Generic Ping probes from displaying. Fixed a bug that would keep the BMU Status widget indefinitely set to ‘initializing’. Added “Map Notes” to Network Sites to be displayed on the Elevation Profile. Adding services with multiple missing fields will now only display one error message instead of many. If an error was thrown, the BMU would redirect to an alternative BMU form. It now redirects back to the initial form as expected. Powercode will no longer attempt to retry processing entries for non-existent BMUs. Setting interfaces to ‘none’ will no longer cause them to process indefinitely in Powercode. Sync will now more consistently occur instead of manually having to be triggered. Fixed a bug preventing Saisei from properly pushing out updated equipment information. Added in a missing trigger event for when temporary grace dates are set for re-activating a customer account. Increased default system timeout to accommodate some larger reports.